It’s almost Easter Bank Holiday Monday which can mean there can be only one place for the Family to go ....Foxhall Heath Stadium, Ipswich for another action packed race meeting in the ‘Foxhall Bowl’. 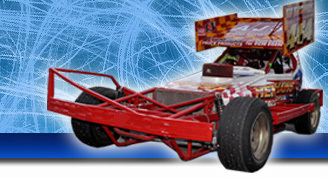 As is traditional, the Whip St Motors Bangers are in Town, joined by the elite oval race cars that are the National Hot Rods and the single –seater rockets that are the Grand Prix Midgets which makes for a very appealing fixture. The Bangers return for another high speed, all crashing - action meeting following their recent outings here. It will be all to race for as they race around the ¼ mile oval smashing, bashing and spinning each other out of the way as every driver is doing their best to be the first to the finish line and take the trophy! Bank Holiday Banger racing at Foxhall Heath Stadium is legendary, always full of action and drama and this meeting should be no exception! 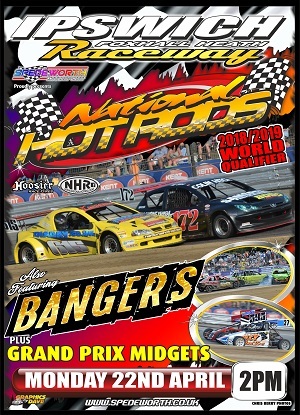 The National Hot Rods return to Foxhall for the first time in 2019. It’s 2018/19 World Championship round eleven for the Drivers and Teams so not only it’s a point scoring opportunity, it is also a chance for some track time at Foxhall in their build up to the big race again this year which is staged over the annual Spedeweekend of 6th and 7th July. At close of press, Newmarket’s three time World Champion, Chris Haird leads the World Series Points with Scotland’s Rob McDonald second and current World Champion, Billy Wood third. Only a handful of points separate the top of the chart so it’s all to race for. Before Foxhall’s Round, there is a Round at Skegness on Good Friday so the points from this weekend are crucial to World Championship Qualification. The Grand Prix Midgets always enjoy a visit to Foxhall where they really get the chance to unleash all their horsepower on the big oval. These cars are small, colourful fast and spectacular. If you have never seen these cars before, they are a sight to behold as they are single seater engineering masterpieces! If you haven’t been to our Foxhall Heath Stadium before then this meeting is well worth a trip not just for the racing but to see the superb facilities which have available. We have two fully seated grandstands along the back straight which can hold several thousand people and offer excellent elevated views of the racing. Wherever you choose to sit in the grandstands you can see all the action around the Ipswich Raceway. We have a covered Grandstand on the Home Straight and we have a grandstand for those who are disabled or have special needs on the Kent Cams bend and our renowned catering facilities, - which offer some of the best Stadium food in the country, - are accredited with a five star Hygiene Rating. Our toilet blocks include baby changing and disabled facilities. Foxhall this Bank Holiday Monday is ‘The’ place to be with the family, see the incredible race action and soak up the atmosphere on the terraces. Set the TV to record and let Spedeworth/Incarace Motorsports give you a spectacular afternoon of racing action and facilities at Foxhall Stadium! Please also visit the ‘Dave’s Graphics and Chris Berry Photography’ Trackshop Superstore, where you can purchase your Souvenir Full Colour Programmes of the event, plus copy of the brand new issue of the Full colour Wheelspin Magazine. There’s Spedeworth / Incarace Merchandise and the amazing all action photos to choose from. Come and join us and let Spedeworth / Incarace Motorsports present to you a racing spectacle that will be a showcase in the memory for many years to come! Turnstiles open at 12.30pm with racing commencing at 2:00pm.